I found this picture on Pinterest, and like most of my pins, I thought: I can do that! But most of my wished projects never materialize because of funding or time! This one was very easy and a little treat for Dooley on his birthday! There were a few things I’d do differently, like not use water soluble dog treats, or make a shorter ice treat, but it still turned out well, and was received well! First, you’ll need a few “additives” like carrots, potatoes, small bits of cheese, or dog treats, water and a tupperware. Fill the tupperware with just a little bit of water, and freeze for a few hours to make sure it’s hardened. After the first layer is hard, add your treats and veggies. Cover with another little layer of water, but this time enough to cover your treats. You can also split this step into two – add just enough water to surround, but not cover your treats. This will hold them into place. The third layer of water will cover them and prevent your treats from floating to the surface. After the second and third layers have frozen well, remove the tupperware from the fridge to present to your pooch. Run under a small stream of hot water until you hear the ice “click”. This means it has released from the tupperware and will slide out into your hands. Present your ice treat to your dead sleeping dog and expect him to lick it on a surprisingly unseasonably cool day. Not. Going. To. Happen. Put back in the freezer, until it’s hotter outside and then top with an enticing layer of his favorite cereal. Pooch will then gobble up said cereal and start licking his ice treat. 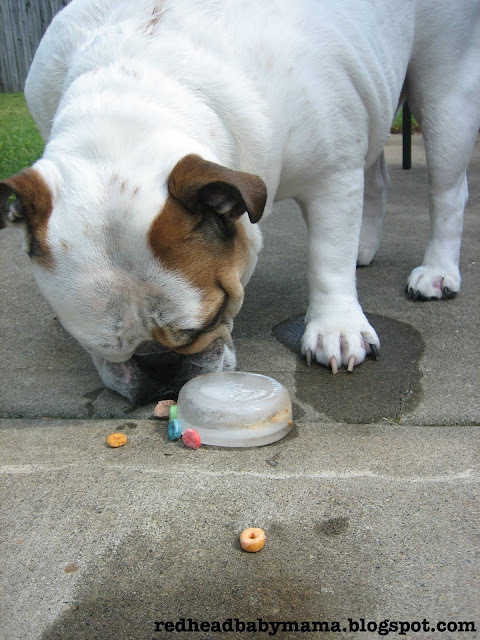 Once they start licking and the weather is warm, the ice treat will melt and your frozen veggies and treats will come to the surface! Follow me on Pinterest if you, too, like projects and wish lists of projects!